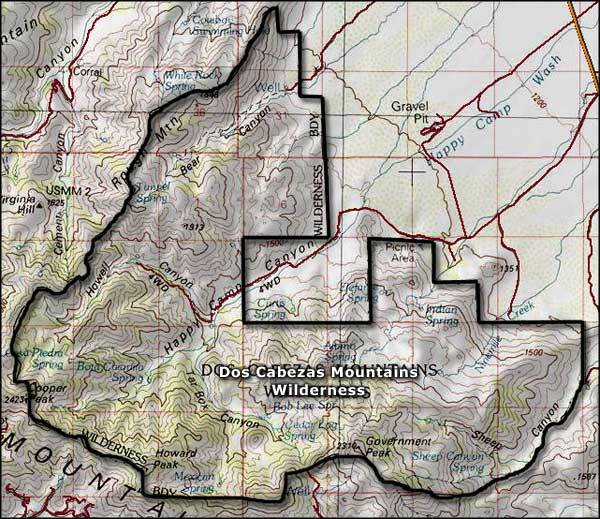 The Dos Cabezas Mountains Wilderness is an 11,700-acre property in the remote and rugged Dos Cabezas Mountains. With steep slopes and many granite outcroppings, elevations in the Wilderness vary from 4,080' to 7,587' at the top of Government Peak. Government Peak is a boulder-strewn mountain with several seasonal waterfalls on it. 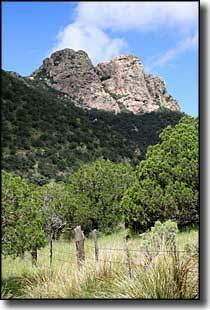 There are also 2 other peaks in the Dos Cabezas Mountains Wilderness that top 7,000 feet. From the summits you'll get great panoramic views into the surrounding valleys and to far off mountain ranges in southeastern Arizona. If you want to go higher, you need to hike over to the Dos Cabezas Peaks, North and South. Both are within a few feet of 8,350'. The vegetation is mostly mountain and desert shrub but several developed and natural springs support riparian areas and lots of wildlife: mule deer, white-tail deer, mountain lions, bald eagles and golden eagles. The endangered peregrine falcon also flies through here often. In Happy Camp Canyon the BLM maintains a picnic area under the tall sycamores near the eastern boundary of the Wilderness. From the picnic area an abandoned road leads up Howell Canyon past century-old mining remains. There are no developed campgrounds anywhere in the Dos Cabezas Mountains but folks who enter the area via Mascot Canyon Road often camp in the pullouts along the road, but be careful not to stray from the road: there is private property on both sides of it. A private landowner has also installed a locked gate across the road but under court orders, he/she must provide visitors a key to the gate. If you plan in advance, call 520-384-3045 or 520-507-3047 to make arrangements about the key. Beyond the gate, the road gets increasingly steep and suffers from serious washout problems: you'll want a high-clearnace 4WD vehicle. From Bowie, go south on Apache Pass Road and turn right on the dirt road leading to Happy Camp Canyon. The wilderness starts at the edge of the parking and picnic area. Photo of the Dos Cabezas courtesy of Matthew J. Nelson. Map courtesy of National Geographic Topo!